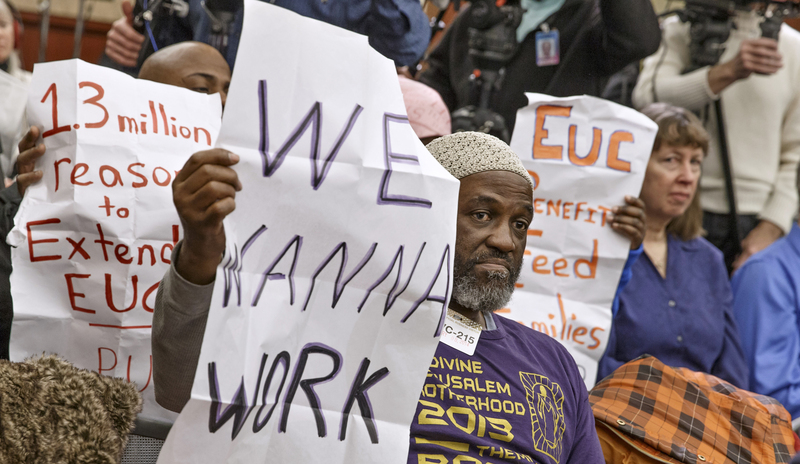 Congress allowed emergency unemployment insurance to expire on December 28, 2013, leaving 1.3 million Americans without a vital economic lifeline. The U.S. Senate is now considering extending these benefits for another three months. Failing to do so would be unprecedented in the history of federal responses to high unemployment following economic recessions. 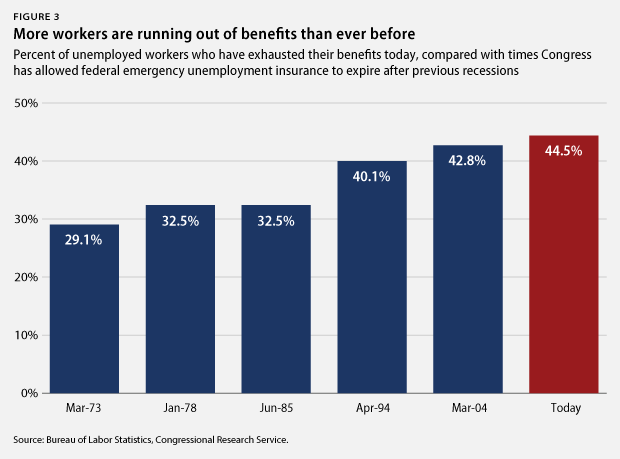 Congress has offered extended emergency unemployment benefits in every major recession since the 1950s, and it has never failed to extend benefits when facing a long-term unemployment crisis as severe as the current one. 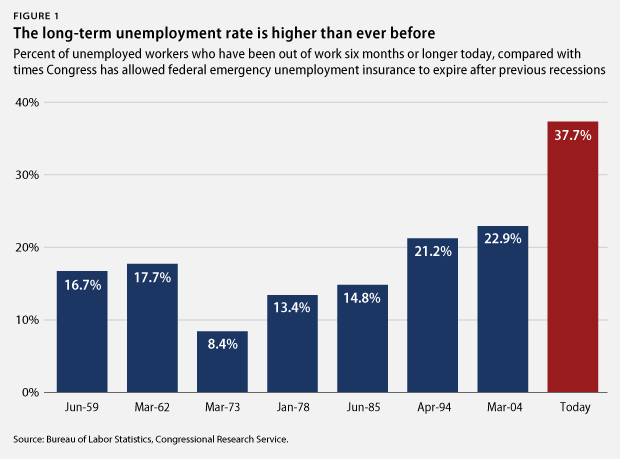 Today, the percentage of unemployed workers who have been out of work long term, the length of time a typical worker is unemployed, and the share of workers who run out of benefits before finding a new job are all higher than they were each time Congress has let emergency unemployment insurance expire following past recessions. Moreover, the national unemployment rate, at 6.7 percent, is still unacceptably high, and there are still three job seekers for every job opening in the country. At times of high unemployment during and immediately following recessions, unemployment insurance provides crucial income support to the unemployed, as well as a much-needed boost to the economy. Unemployment insurance supports the unemployed while they search for a new job, keeps millions of Americans out of poverty, and spurs economic growth. In fact, the nonpartisan Congressional Budget Office, or CBO, estimates that extending federal unemployment insurance benefits will create 200,000 new jobs in 2014 and boost U.S. gross domestic product, or GDP, by 0.2 percentage points. Below are five key reasons why Congress must extend federal unemployment insurance. The U.S. economy is slowly improving, but the unemployment rate remains unacceptably high. 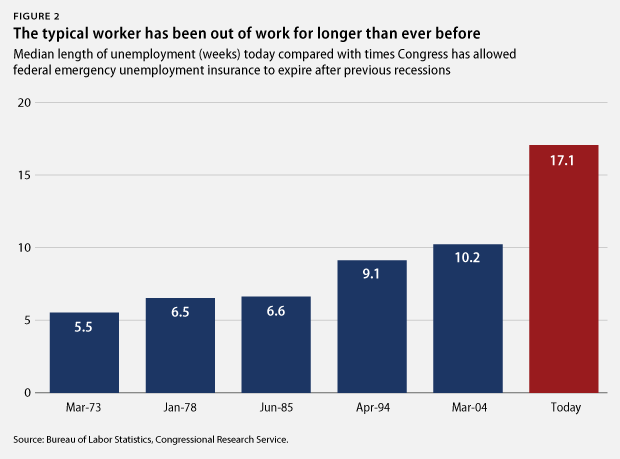 At 6.7 percent, the unemployment rate today is higher than it was six out of the past seven times Congress allowed emergency benefits for the long-term unemployed to expire. The ratio of job seekers to job openings has improved since the height of the Great Recession, but there are still three job seekers for every one job opening in America. In a strong labor market, that ratio would be closer to 1-to-1, as it was in 2000 and 2007. As President Barack Obama recently advised, “voting for unemployment insurance helps people and creates jobs.” Allowing federal unemployment insurance to expire while the country faces a long-term unemployment crisis would be both unprecedented and unwise. Lawmakers should do the right thing for workers and our economy by immediately extending federal unemployment insurance for the long-term unemployed.